The second issue of The Confessional Presbyterian began a growing trend toward fatter issues. It is 256 pages (approx. 276, 112 words). The most significant material here if I may express an opinion is the first part of the series on sixty years of literature on the subject of the Regulative Principle of Worship. Also with issue 2 we began a trend of running, in what I think is the most overlooked feature of the journal, first time translations of interesting if not important texts on a variety of subjects. This issue ran a translation from a work by the student of Samuel Rutherford, John Brown of Wamphray, Libri duo: in priori, Wolzogium, in libellis duobus de interprete Scripturarum, causam orthodoxam prodidisse demonstratur. In posteriori, Lamberti Velthusii sententia libertino-Erastiana, in libello vernaculo de idololatria & superstitione naper proposita, detegitur & confutatur (Amstelodami, 1670), on the subject of the universal visible church. This issue remains in print. To purchase this and other volumes see the online store. 3. Baptism and the Benefits of Christ: The Double Mode of Communion in the Covenant of Grace. By R. Scott Clark, D.Phil. 43. Liberty of Conscience in the Westminster Confession and its Application to Modern “Worship Wars.” By John (Jack) Allen Delivuk, Th.D. 61. An Analysis of Open Theism. By W. Gary Crampton, Ph.D.
71. 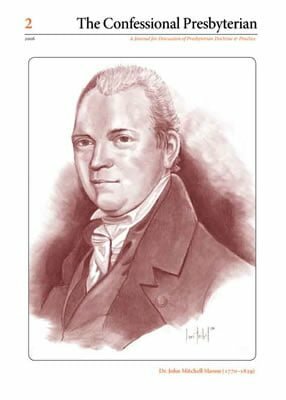 Francis Makemie and the Meaning of American Presbyterianism. By D. G. Hart, Ph.D.
165. Reviews & Responses: Leonard J. Coppes, The Divine Days of Creation (Response by Dr. Leonard J. Coppes to “Reply by Dr. Benjamin Shaw”) 165 ■ C. N. Willborn, Ph.D., “In Thesi Deliverances,” The Confessional Presbyterian 1 (Response by Stuart R. Jones) 167 ■ Sean Michael Lucas, Robert Lewis Dabney: A Southern Presbyterian Life (C. N. Willborn, Ph.D.) 172 ■ George M. Marsden, Jonathan Edwards: A Life (W. Gary Crampton, Ph.D.) 175 ■ Lewis Bevens Schenck, The Presbyterian Doctrine of Children in the Covenant (Rowland S. Ward, Th.D.) 181 ■ Guy Prentiss Waters, Justification and the New Perspectives on Paul (J. V. Fesko) with Response (Guy Prentiss Waters) 184 ■ Samuel Rutherford, The Covenant of Life Opened (Guy M. Richard) 189 ■ Tim Gallant, Feed My Lambs (Leonard J. Coppes, Th.D.) with Response (Tim Gallant) 193. 211. Antiquary: T. & J. Swords. Part One. Printers During the Federal Period to Doctors, Scientists, Friendly and Calliopean Clubers, and other New York Literati, as well as High Churchists, and the Occasional Presbyterian. In Brief: Introduction to the United States Christian Magazine of 1796 (19) ■ John Mitchell Mason on the New York ‘High Churchism’ Controversy (88) ■ Transcription of a Letter from T. & J. Swords (205) ■ Extracts from Sermons by Samuel Miller and John M. Mason published by T. & J. Swords (233–236).